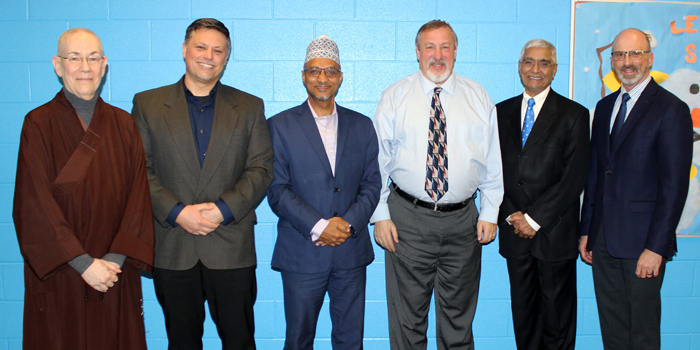 Pictured, from left, Venerable Wuling, Dr. Tim Hallman, Dr. Rashied Omar, Rabbi Lenny Sarko, Dr. R. V. Prasad Mantravadi and Dr. Allyn Decker. WARSAW — The Kosciusko Community YMCA and the OrthoWorx Diversity Committee collaborated to draw an outstanding turnout for the first Diversity Discussion of 2019, titled “Faith for All: Understanding Global Religions and Their Practices,” recently held at the YMCA. Panelists elaborated on what individuals can do to change common misconceptions about each other and their respective practices, fostering positive and meaningful interactions with others. Panelists and the faiths they spoke about included Venerable Wuling, Buddhism; Dr. Tim Hallman, Christianity; Dr. R.V. Prasad Mantravadi, Hinduism; Dr. Rashied Omar, Islam; and Rabbi Lenny Sarko, Judaism. Each panelist spoke about basic tenets in their different belief systems, including important concepts such as reincarnation and eternal values. This community is home to a wide range of faiths and cultures. As there is a rise in tension between differing groups and ideas on a national level, the YMCA and the OrthoWorx Diversity Committee seek to ensure that the community continues to work together. This event provided an opportunity for community members of varying faiths to meet, chat and ask questions in a casual, engaging environment. The panelists shared academic and spiritual knowledge with the room, prompting several audience members to ask questions, which gave the panelist and some of their invited guests the chance to elaborate on certain tenets in their faiths. The panelists noted that despite differing names, languages and traditions, the values shared by those faiths are very similar. Christianity, Islam and Judaism begin with the teachings of the same prophets, while Hinduism and Buddhism originated in Ancient Asia and are known as belief structures rather than religions. “The community response and interest has reinforced the mission of diversity discussions to promote learning and understanding between varying groups that live in Kosciusko,” says Dr. Decker. “We saw invaluable results at the February event and plan to carry that momentum into planning further interfaith programs.”The panel discussion ended with a final note that gatherings such as these are what makes peace and understanding possible between people. To anticipate future diversity discussions, participants can take a survey designed to capture feedback on the turnout of the event and determine topics that community wants to learn about in the future, which can be found on http://orthoworxindiana.com/initiatives/talent- attraction/. The community is encouraged to attend upcoming diversity discussions as the year progresses.